Zetty Ashley’s husband Tim has one piece of advice when it comes to playing the Powerball lottery; never play without the Powerplay option. That was in Ashley’s mind when she bought three Powerball tickets at the store where she also bought dinner for her husband. 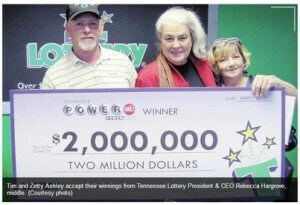 A few days later, they check to find that they one of the tickets have won a million – multiplied by two because of the Powerplay option. They have gone from trailer living people driving a clunky old car to millionaires in an instant. The couple are very careful with their new riches, depositing their winnings in different banks accounts. They still buy marked down items and may look for a used car. To them, a happy and healthy family is all the wealth they need. Their windfall is just icing on the cake.